Daily Schedule- A DETAILED OVERVIEW! I get asked all the time about my daily schedule. My Daily schedule is organized down to the minute. I run my day different than most teachers, so I wanted to go into detail about each part of the day to help you understand the flow of our day! 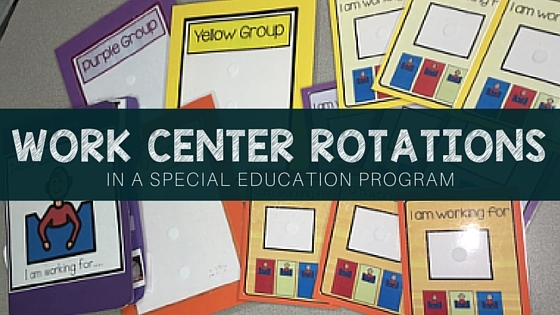 I keep everyone on the same schedule and make individual accommodations within each rotation/activity. By keeping the whole class **(for the most part) all together, it makes staffing and planning that much easier. I am able to utilize my aides much easier this way! **for the most part- by this I mean…of course not everyone can be doing everything together due to individual/group services such as speech, or OT. So how do I handle this? Here is how I do it... During APE, my whole class does PE. This means that my students that do not have APE go to PE to do their own physical exercise while those that do have APE go with their teacher. 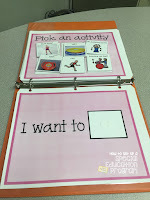 During OT, the rest of the students do a craft of some form while those with OT go to OT. The tricky service is speech. Lucky for me, I have been able to schedule speech at convenient times so that my students don't miss "core" academics. When students miss something during speech or absences, they get caught up during "catch" up time. I schedule catch up times once a week or so when we have a random occurrence that throws off our schedule (assembly, fire drill, short staffed and can't run centers, a lot of absent students, evacuative tantrum etc,) Once they have completed all their work up until that point, they can work on a preferred academic task such as computer, iPod, iPad, puzzles, coloring etc. ***but what about those kids that can only stay on task for one minute? Simple. They stay on schedule. If the class is doing calendar, than he/she is participating in calendar. 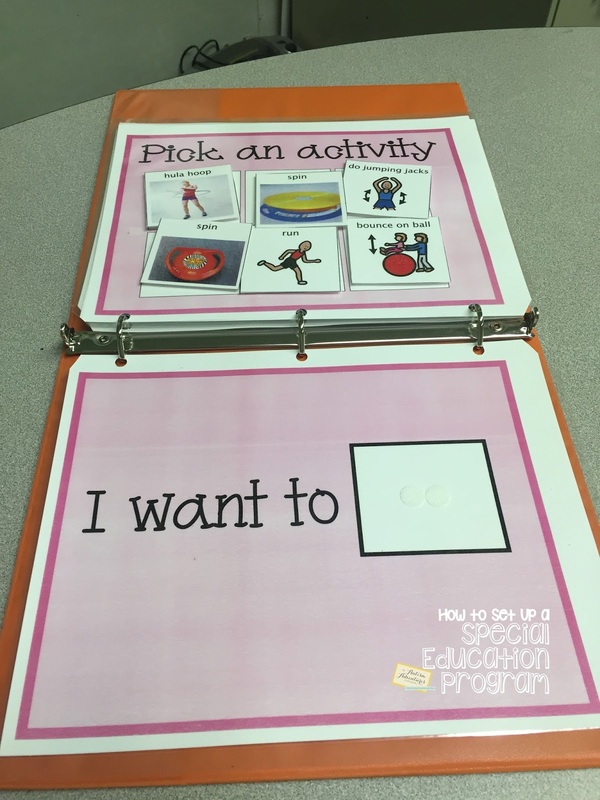 However, embedded in this student's calendar routine, he/she may know that after each page in his/her calendar book, he gets to stand up and pace for 30 seconds or pull out his stress ball for one minute.) ETC ETC ETC. Check out my post on sensory integration for more information. ****but what about those kids that are SOOO much lower than the other's that they can't participate with their peers? Simple. They stay on schedule. Every child needs exposure and needs to feel included with their peers. Every activity I do is differentiated. For example, during reading center some students are working on comprehension, some working on sight words, and some listening to a story on a CD. BUT THEY ARE ALL AT THE TABLE WORKING ON THEIR READING GOAL AT THE SAME TIME! etc etc etc. Morning Fitness takes place first thing in the morning.. After school wide flag salute students go straight to the playground for free play for a few minutes. Once everyone is situated, I start morning fitness. It changes every day and is the most laxed part of our day. Every day we do different activities. Some examples include: swing 50 times, run around the handball courts, shoot the basketball, play tether ball, handball and soccer. I try to keep it fun and incorporate sharing, rule following and team building skills. It's not necessarily a drill sergeant type of PE. I use these visuals to prompt students to the activity. Sometimes we only do one activity in the morning, and other days we do several. 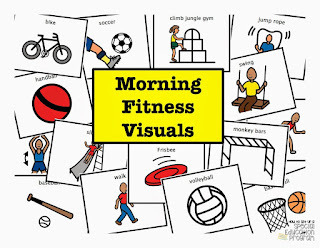 The most important thing that occurs during Morning Fitness is that my aides take students to the bathroom either in groups or individually based on their needs so that we don't have any bathroom interruptions once we get into the classrooms. The ones that need assistance get it, and those that just need to be sent go on their own. 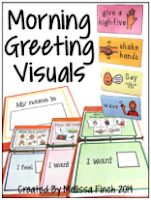 This makes the morning routine in the classroom way better with less interruptions. This is the first thing we do when we step into our classroom following our morning fitness. My students put all of their belongings away in their lockers, check their schedules and sit down to start Morning Meeting. Morning Meeting is a 15 minute activity that, in my opinion, starts the day in a fun way! Morning Meeting is different every day but works on the same necessary life skills: communication, social skills, and team building skills. The main goal of Morning Meeting is to take attendance and say good morning to everyone. 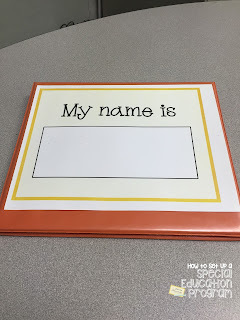 While I am conducting Morning Meeting, my aides can check my students back packs, pull out any communication logs, get student lunch/snack out, and have the morning centers ready to go by the time Morning Meeting is finished. Like I mentioned above, we do different activities every day. We rotate through them so that my student's don't get bored! First, we sing good morning songs. 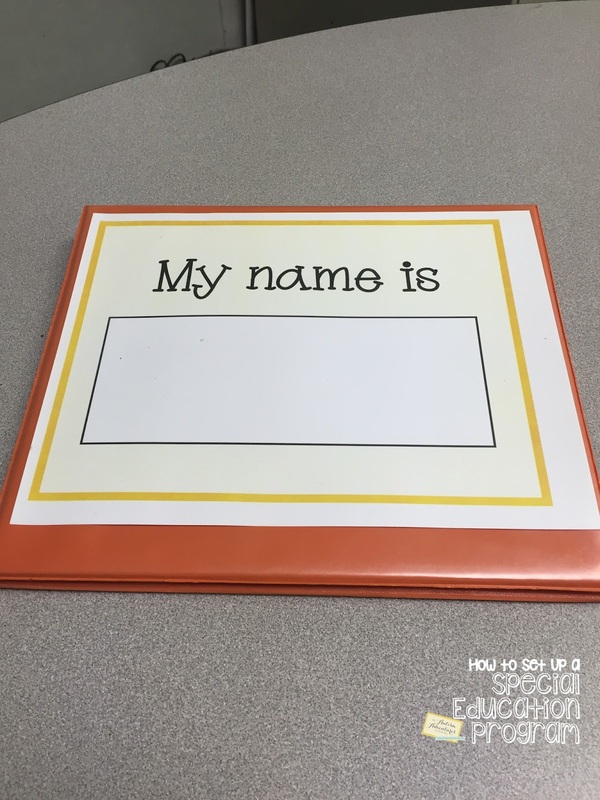 Next, I call students up to the front of the room to “check in.” Their names are laminated and attached to the board with a magnet. 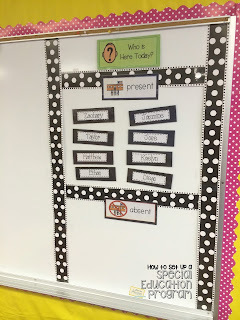 Students find their name and put it in the “present” or “absent” spot. I love using the magnets because it makes it super interactive! Once the student has “checked in” on the interactive bulletin board, they get to choose a greeting to give me. The choices are: wave hug, high five and shake hands. I have visual cues to help aide the students. They have a lot of fun picking which greeting they will do for the day! We also work on answering questions. 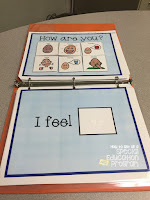 I have created a simple question binder that is laminated and attached with velcro. I use this once or twice a week. Here are some pictures of my binder and the questions I ask. After we complete morning meeting, students check their schedules. I absolutely LOVE my work centers! Here I will only be discussing the system of work centers, not the "work" and curriculum that takes place. I have finetuned this system to make it the most efficient system for my students. 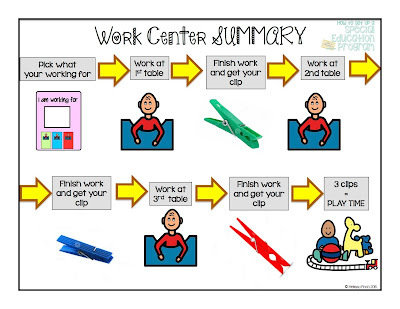 I love my work centers because it promotes independence and it is consistent! 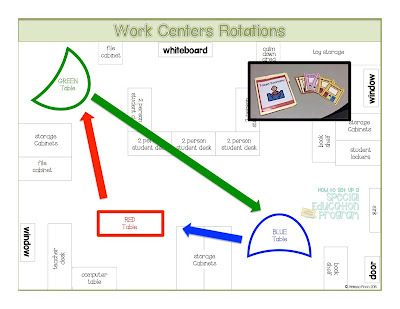 I have 3 work centers during our work center rotations. There is a RED, BLUE and GREEN table. Above each labeled table is a cute little sign to make it more noticeable which table is where. Morning work centers takes place right after our Morning Meeting. Students check their schedules and get their working card. They are passed out once they check their schedule. 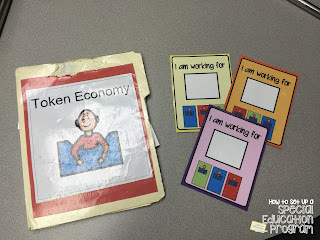 I come around and let them choose a toy/activity that they are going to "work for” from our token economy folder. Once they all have their working cards and activities picked, work centers start! Students are grouped into 3 groups (3 students per group.) Each student group has their own group color: purple, orange and yellow . I have the student groups posted on the back cabinets so that all the staff and students know where they are supposed to be when! Each groups working card has the color table schedule on the bottom so that the student knows which table they are to go to first! Working cards are carried by the student from table to table. Each group's working card has visual cues at the bottom of the card indicating the order of tables they will attend to (Ex. 1st Red table, 2nd green table, and 3rd blue table). The working card serves as a great reinforcer for my student's. 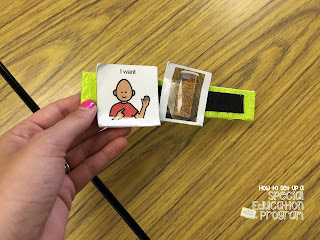 When a student becomes unmotivated or begins to act out, a simple prompt to the working card reminds the student that they will be rewarded for good behavior and hard work. At the end of the rotation, if the student has completed their work and behaved appropriately they receive a colored clip to clip on to the working card.. We spend an hour total during the morning work centers. We spend 15 minutes at each center totaling 45 minutes of work time. 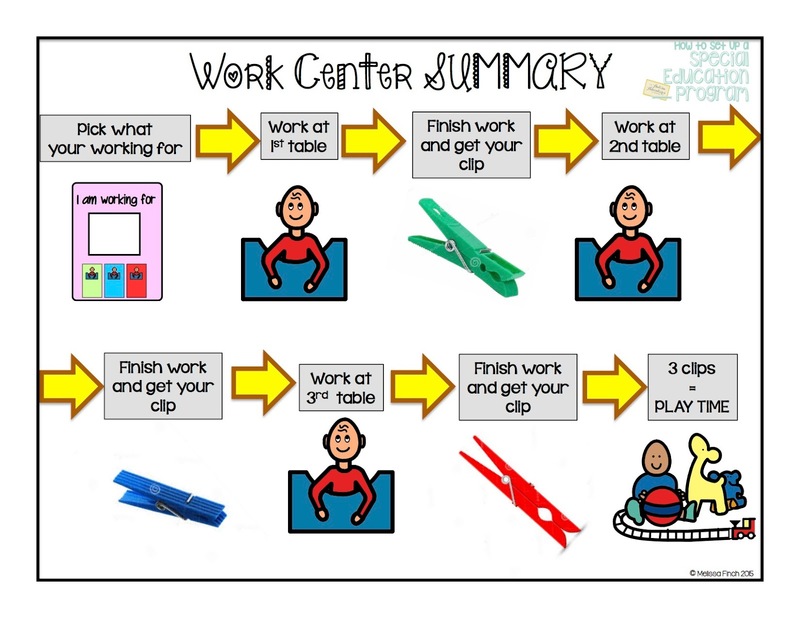 If the student has earned all 3 clips after work centers, they place their working card on their desk and "trade" it in for their preferred task/activity. For those student's that did not earn all three clips, they return back to the table they did not earn their clip from and finish their uncompleted work. Student's are held accountable for their behaviors, and must earn free time. The students have about15 minutes to play and clean up before snack time! After the earned free time after work centers students check their schedule and get ready for breakfast/snack. The entire school gets to eat snack during recess. However, I do snack inside my classroom before recess. I like to keep it structured and functional within the classroom so we have all of our tools handy. I utilize this time of day to really focus on communication. 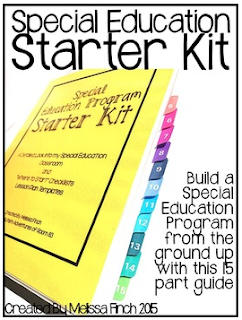 My school SLP pushes in during this time to help with different students and their IEP goals. Overall, this is a quick 15 minute snack time that takes place in the classroom. The rule is- “if you don’t ask, you must not be hungry.” During snack we have communication devices, switches, PECs books and iPad apps. Recess is exactly what you would expect- play time outside. Recess is a very unstructured activity. In an ideal world, all of my students would mainstream with their peers for social interaction with no challenges. Of course, this is not the case. I have some students go to the playground during recess while other’s who have more anxiety surrounded by huge groups of people play on the grass. I store a bunch of outside appropriate toys in a wagon so that students can roll out the toys during recess to the designated grassy play area. My staff work hard to recruit and supervise social buddies during recess to promote communication and social interaction for my students. I do not go out to recess with my staff, this is my only teacher prep time during the day! After recess, my students come in and participate in reading time. 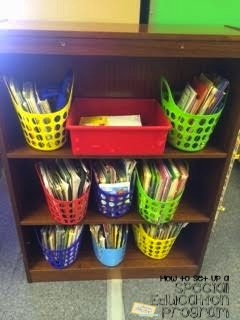 I have a book helper pass out book baskets to students and let each student pick a book or two. 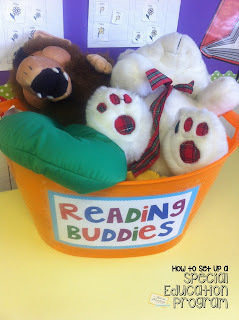 If the student is on task, I allow them to get a "reading buddy" to help them read. Some students choose to read to their "reading buddy." "Reading Buddies" are such a FUN way to teach our students to remain in their seats and read/look at a book. It helps them stay engaged and interested! My reading buddies change depending on the interests of my students. This year I have some stuffed animals, blankets and pillows. It's important to note: the stuffed animals and toys that are in the reading buddies time are ONLY used during reading time. They are not uses as reinforcers or toys throughout the day. I try not to mix the toys for different activities or their novelty will wear off! I keep my books in book baskets. I've found its much easier to grab a basket and walk around to let a student choose a book from the basket. The library gets too messy without the baskets as my students have a difficult time sliding the books in a bookshelf! The baskets are a quick fix! During book time I play classical music to help calm my students after an active recess. It is during book time that we also do all of our toileting needs for the second time in the day. My aides take the students who need supervision in small groups. The ones that have health needs/diapers are taken one by one to the changing room. I stay in the room and supervise the students that are not using the restroom at the time and interact during reading time. We are efficient and are able to get all toileting done in 15 minutes or so. I choose to do this all at once (3 x a day) to minimize the distractions during work centers and such. If a student has to use the restroom and an aide needs to go, it can throw off the work centers. I have taken over the handicapped bathroom with a ton of visuals. 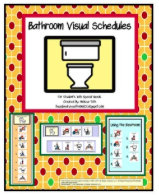 I use visual supports within the restroom to assist students who are being potty trained. Our afternoon work centers are exactly the same as they are in the morning, except different work at each station. 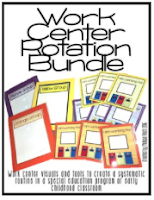 Students know the routine, get their working card and rotate between the tables before they earn their reward. After the students have earned their free time after work centers, I do a whole group calendarroutine. During this time, majority of my aides are taking their own lunch. This means I have one aide and 10 kids to get through the activity! Because of this, I keep it hands on and engaging to eliminated boredom and runners!. Calendar skills carry over into many aspects of our daily living. With that being said, I am sure to differentiate the "traditional" calendar routine so that each kiddo gets the most out of it. In the front of my room I have a large calendar set-up on my white board. The calendar is all laminated and interactive to keep my student's engaged. All of these pages up on my bulletin board are the individual pages from my Interactive calendar books. I just mounted them on black construction paper to make them "pop" on my whiteboard. While utilizing this calendar bulletin board to drive the calendar routine, my students all participate in their own way through individualized calendar materials. We go through each step together in a strict routine. I also incorporate TONS of music from various CD's I have collected and songs I have found.. Here are all of the variations I use during my calendar routine! 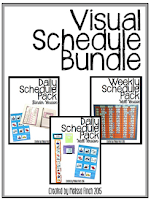 CalendarBooks: These books I created are printed, laminated, binded and velcro'd. During the calendar routine, student's follow along with the rest of the class. The calendar books mirror the calendar bulletin board in the front of my classroom. As we cover each page in front of the class, students attach the correct velcro icon to their own book and read the sentence. 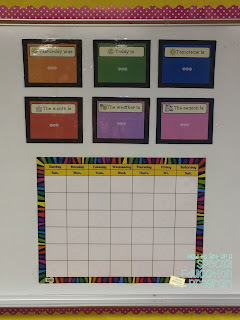 CalendarBoards: I made these simple calendar boards for my lowest students who get frustrated or mess around with velcro pieces! They are expected to point a long. 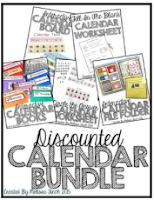 CalendarWorksheets: I have designed two different worksheets to be used during my calendar routine. One is for circling answers and one is for writing answers with the use of a word bank. CalendarFile Folder: I created an interactive velcro file folder that can be used during calendar time. 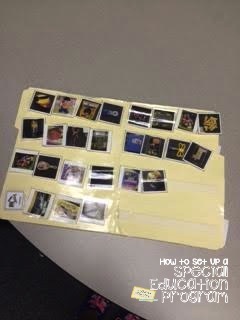 All the velcro pieces are included in the file folder. Students fill in each sentence frame to follow along with the calendar routine! Like recess, I am not with my students during lunch. It is my chance to eat lunch and enjoy some quiet! However, lunch is still a huge learning process for my students. Communication is the main focus during lunch. Once students are done eating they get to attend recess outside with the rest of their peers. After lunch, my students come in and check their schedules for rest time. Rest time is similar to our book time after our morning recess. Students rest while my staff take students to the restroom either individually or in groups. During rest time, we turn off the lights, turn on a disco ball (YES A DISCO BALL), listen to music and relax. Students can choose to lay in bean bags, peapods, swings, or with blankets and pillows. Students can also choose to read a book or play with a puzzle. Rest time is a great activity to give my students a break and a chance to re-collect themselves before the end of the day. Our afternoons are a little more flexible. Our activities change depending on the day. This year we had whole group OT on Tuesdays which was always a blast. Monday’s and Thursdays were typically art projects or sensory games. Fridays were ALWAYS movies! We work for Fun Friday in my classroom. In our district, students have minimum days on Wednesdays for staff meetings so my students leave right after lunch. Need help setting up your own Daily Schedule? Here are some resources you can use to help get set up! 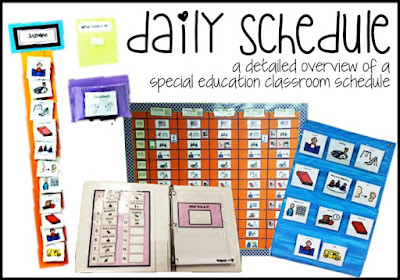 Looking for a COMPLETE guide to set up your classroom? Check out my Starter Kit. Set up your program with this 15 part guide! 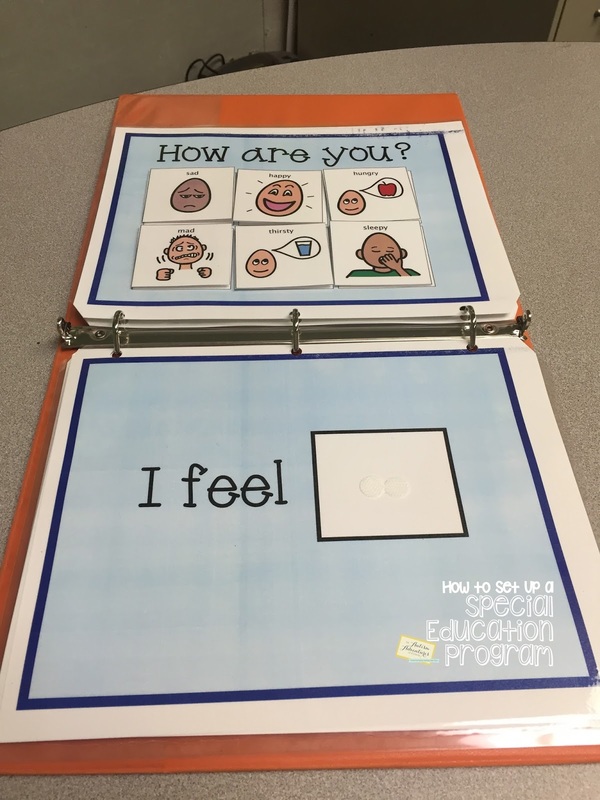 I'm a first year SPED teacher. This was so helpful!